Built for the professional this is the most Advanced System for finding the location, depth, and size of steel reinforcement bar, post tension cables, copper and conduit in concrete brick, masonry or other non-metallic construction materials. Cover Map feature ( a diagram of depths of the rebar ), electronic data storage, and Rebarlinx® software for PC upload can also be included with the system! Complete Upgrade for Rebarscope™, requires upgraded unit returned to be service Yellow rugged Rebarscope™ datalogging unit for the determination of rebar cover, location and diameter. Sensor probe for use with the R-Meter Mk III™ and Rebarscope® rebar locator. Rebarscope® PC Software Sensor probe for use with the R-Meter Mk III™ & Rebarscope™ for the determination of rebar location, rebar sizing and rebar cover. 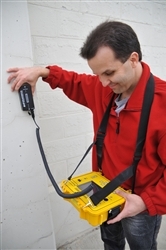 Rolling Scan cart for use with the R-Meter MK III & Rebarscope® complete system, allows you to easily and accurately determine rebar cover and location when surveying a large area such as a parking garage or bridge deck.